The words ‘enormous’ and ‘gigantic’ are barely fit for purpose when describing a cannibalistic elliptical galaxy that has been measured by the Gemini South Telescope to tip the scales at 30 trillion solar masses* – 50 times more massive than our Milky Way Galaxy. This obese galaxy, at the heart of the Abell 3827 cluster, 1.4 billion light years away, has claimed the title of the most massive galaxy known in the local Universe. The eight-metre Gemini South Telescope�s image of Abell 3827, with the giant galaxy ESO 146-IG 005 at the centre. Image: R Carrasco et al/Gemini Observatory/AURA. Galaxies evolve by merging, sometimes with smaller galaxies in so-called ‘minor mergers’, and sometimes with larger galaxies in ‘major mergers’ that transform spiral galaxies into amorphous elliptical galaxies. These major mergers are far more frequent in galaxy clusters, where many galaxies are packed together in relatively tight spaces. Messier 87, in the Virgo Cluster, had been thought to be one of the largest at 2.4 trillion times the mass of the Sun, but the galaxy in Abell 3827, called ESO 146-IG 005, blows it out of the water. It has grown to such immense size by gobbling up not just one or two, but many galaxies that have had the unfortunate luck to run into it. “The magnitude of its appetite has not been fully appreciated,” says Gemini’s Rodrigo Carrasco. The galaxy has proven to be something of a messy eater too – in the Gemini image, the bright cores of four galaxies can still be seen near ESO 146-IG 005’s centre, as snacks still to be digested. “Eventually it will grow even bigger judging by the number of nearby galaxies already in its grasp,” adds Michael West of the European Southern Observatory, who initially observed the galaxy and its cluster a decade ago. 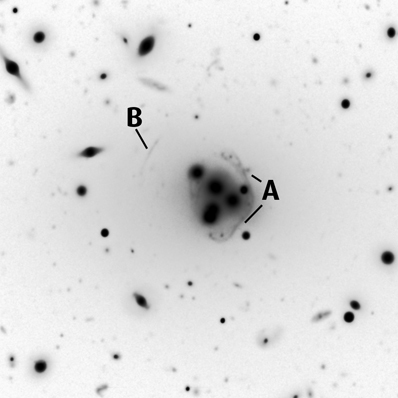 This negative image shows the four remnant cores of galaxies in ESO 146-IG 005 and the lensed images of the 2.7 billion light year distant galaxy (A) and the 5.1 billion light year distant galaxy (B). Image: R Carrasco et al/Gemini Observatory/AURA. 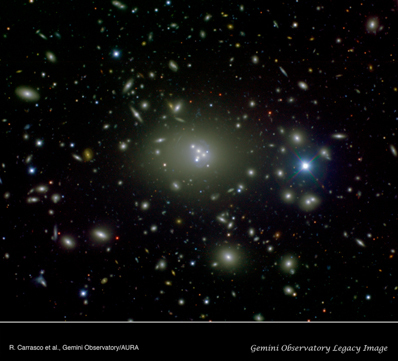 To measure the galaxy’s mass, the team including Carrasco and West got a helping hand from Albert Einstein, who had been the first to predict the existence of gravitational lenses via his General Theory of Relativity, which describes how mass can bend and warp space. An extremely massive object, such as ESO 146-IG 005, can bend space sufficiently to magnify light from more distant objects behind it, like a giant lens, in this case lensing the light of two galaxies 2.7 and 5.1 billion light years away (equating to redshifts of 0.2 and 0.4). The light of the galaxy 2.7 billion light years away is warped into an arc that wraps around ESO 146-IG 500, while the 5.1 billion light year distant galaxy appears stretched out. The extent of the gravitational lensing is dictated by the amount of mass in the object doing the lensing. “The gravitational lens that we discovered allowed us to estimate the mass of this monster galaxy very accurately,” says Carrasco. “The inferred mass is a factor of ten greater than previous estimates derived from X-ray observations.” These X-rays are produced by hot gas around a ravenous supermassive black hole at its centre. The findings will appear in an upcoming edition of Astrophysical Journal Letters. *To put 30 trillion solar masses into context, one solar mass (the mass of our Sun) is 1.98 x 1030 kilograms. That makes the total mass of ESO 146-IG 005 to be 5.9700,000,000,000,000,000,000,000,000,000,000,000,000,000 kilograms (5.97 x 1043kg)!